No, I’m not referring to a religious experience, but … well, almost. I have a fair bit of luck out here “label shopping” for wine. Usually (and I do mean, not-always-usually) if a wine-maker puts some heart and money into the bottle, it’s a reasonably good wine, especially in the price-tier of wines I generally shop in. I stay away from the expensive stuff, because there’s really no point in developing a taste for something if I can’t afford to buy a second (or third) bottle of it. And those few occasions when the label is … well, misleading … I at least get an opportunity to trash the wine in a blog entry. We had guests visiting from Down Under, and I picked this off the shelf at the local grocery store for under $20 as something adventurous to try. It’s a remarkable wine. 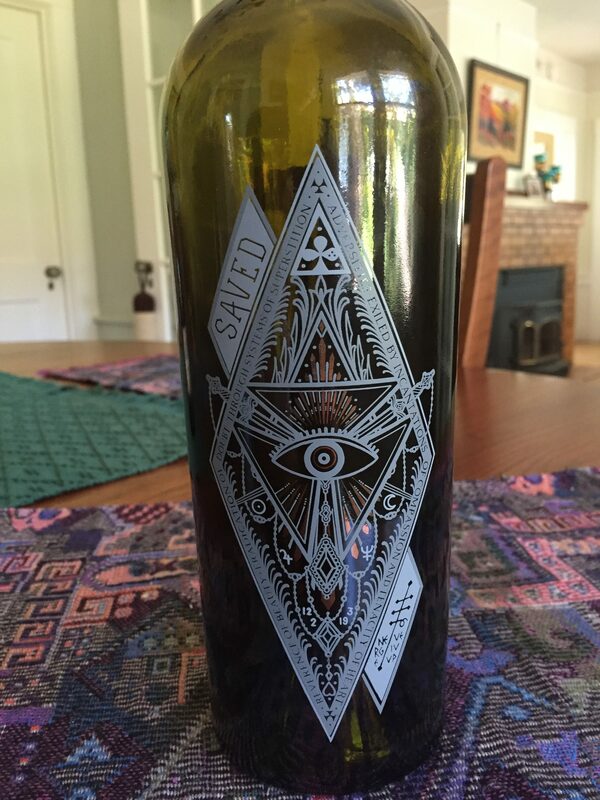 Looking for the inscription on the web, to see if it’s some literary or historical reference, I stumbled across another review, which claims that this is a blend of Zinfandel, Carignane, Petite Sirah, Malbec, Merlot, Petit Verdot, Mixed Blacks, Ruby Cabernet, and Syrah. For a blend, that is a horrifically complex recipe. The result is well worth it. Indeed, I can only think that the inscription refers primarily to the making of this wine, and if the recipe is a matter of superstition, then superstition certainly inspires a reverence for beauty, and dispels all doubt.